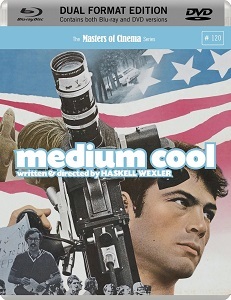 Fact and fiction intertwine in Medium Cool (1969), the combustible feature debut of celebrated cinematographer Haskell Wexler. This impeccable, director-approved transfer really helps underscore the rawness and urgency of a flawed but dynamic piece of politically-charged vérité. A loose narrative is framed within the lead up to the actual 1968 Democratic National Convention in Chicago. Wexler zeroes in on a disillusioned, post-Kennedy US – a county at war with itself and in the midst of the debilitating Vietnam conflict. A number of scenarios typify the mood: from civil unrest in the streets and college campuses, to the simmering racial tensions in the city’s socially-deprived areas. Robert Foster is John Cassellis, a jaded TV cameraman who puts himself on the front-line of these conflicts, as Wexler’s probing camera takes on many guises throughout. It acts as POV, occasionally a willing participant, and sometimes more of a passive observer. The stripped-down, experimental approach and the straight documentation – a part fictionalisation of these tumultuous times – offer a fascinating and sometimes chilling blend as real footage is factored in. The representation of sexed-up media coverage has a timely feel; the opening, where Cassellis and his sound man coolly and impassively film the aftermath of a fatal car smash, predates last year’s Nightcrawler by several decades. The cameraman’s revealing chat to a single parent whom he befriends (Verna Bloom) about the manipulation and deception involved in his profession has the same relevance in a modern media landscape as it did back then. A huge poster of Jean Paul Belmondo in Cassellis’ apartment is an obvious nod by Wexler to the French New Wave – a movement from which many of his techniques here are derived. But unlike that work, Medium Cool can’t quite reconcile the fictitious construct with its real-world conceit. The staged slithers of plot sometimes struggle to compete with the compelling documentary footage, and there’s a gnawing awareness that Wexler’s characters are essentially being shoe-horned into the unfolding real-world events around them, rather than an organic merging of the two. You can’t argue with the film’s inclusion into the United States National Film Registry. It’s certainly an absorbing and culturally-significant document of those times, but more often than not, it comes over as series of striking, spontaneous vignettes.